APPLICATION: The RU-VA2 is the optimum choice where connectorized, rack-mounted video attenuation is needed. This unit features two separate, passive isolated channels. A single input jack is provided for each attenuator. The output jack is intended to be connected to a 75 Ω terminated load. A front-panel knob is provided to adjust hot video levels down to the normal 1 volt p-p signal level. 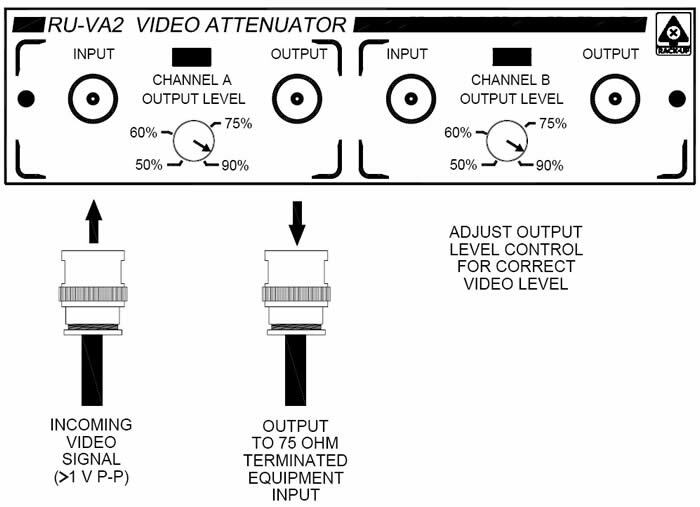 A single attenuator is capable of adjusting down the video level to half the incoming signal level. an RU-VA2 can be conveniently added to a rack so it is available when needed. Rack-mount using optional RU-RA3 triple rack mount or RC-1U rack chassis. front mount to a panel or backboard using optional MB-1 mounting set. Mount to cabinet using RU-BR1.